Description:- I’m still here. Still immortal. 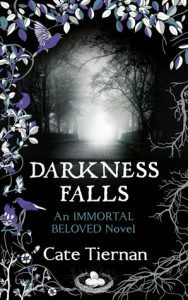 The eagerly anticipated sequel to Immortal Beloved, the deeply alluring gothic romance. And yet night after night, he–who has kicked down hundreds of doors–had not brought himself to knock on mine. Are you dizzy from being flung into my world like this? I feel the same way every morning when I open my eyes to find I’m still me, still here. Review:- I must say I really enjoyed this Cate Tiernan novel. I had read Immortal Beloved and loved it. Cate is a fantastic writer and although there were issues I thought with Immortal Beloved, particularly in the way it kept doing flashbacks to give history to the story, in Darkness falls this was rectified. I started it and felt that it immediately picked up where the first book had left off despite the length of time that I had between reading book 1 and 2. Nas regresses slightly and returns to her old crowd, behaves like a suitable recovering addict falling off a waggon but ultimately this forms the crux of the story, that she has witnessed and done things that are not pretty and somehow she must come to terms with this. Darkness Falls continues the story and gives us a much greater storyline as to how everyone got to where they are, and the factors influencing some of their decisions/actions. This helped tie up some of the loose ends from book one and has also set up nicely a couple of ideas of where the plot could go for book 3. The romance side of things never really gets going and if you are looking for a typical paranormal romance story then you won’t find it here. The romantic development with Reyn is put to one side as Nastasya grows as a person and the melodramatic climax to the romance is well, erm melodramatic and rather empty at the end of it. The love triangle element that comes in with Amy only made me actually really dislike Amy as I didn’t think she added anything to the already complicated relationship structure and maybe this was thrown in as an afterthought. However, overall I really enjoyed this book. The pick up in pace from book 1 was great and there was action right from the beginning. In the first book there were a lot of flashbacks to the past that kind of dragged the storyline down. In Darkness Falls the flashbacks are few and far between and I really think it helped and made the book much better than the first novel. Guest Review from the lovely Charlotte, thank you Charlotte. Disclaimer:- I was sent this book from the publisher in exchange for an honest review, thank you.